The Lander Blue turquoise mine in Lander County, Nevada was first claimed in 1973 and produced some of the most beautiful spider-webbed turquoise ever discovered. 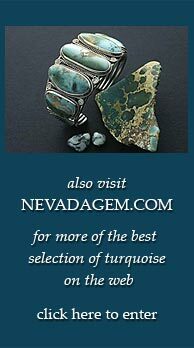 Today it is considered the rarest and the most valuable turquoise known. Lander Blue was a very rich pocket discovery and has been referred to as a “hat mine,” a term used to describe small floats of turquoise because they could be “covered with a hat.” Less than 110 pounds of this beautiful spider-web turquoise was ever mined. When you buy Lander Blue turquoise from us you are buying directly from the owners of the Lander Blue mine. Every Lander Blue cab and item of jewelry comes with a ‘Certificate of Authenticity’. © Copyright 2019 Nevada Gem. All rights reserved. Website design by YK Design.